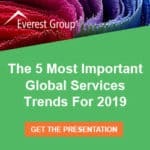 In the context of this accelerating change, our experts will share the 5 most important trends in sourcing today – helping you to understand and focus on those trends that will impact you most. In this fast-paced 60-minute webinar, we will identify the trends, then explain and discuss what they mean for your job, both today and in the future. 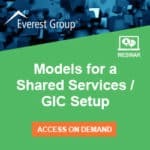 Executives looking to understand the key developments across outsourcing transaction trends and their impacts, trends in Shared Services or Global In-house Centers (GICs), and service provider developments. Can’t join us live? Register anyway! 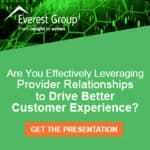 All registrants will receive an email (typically within 1-2 business days of the live delivery) containing the link to session slides and on-demand playback.